It was a brilliant Saturday afternoon. I couldn't have asked for a finer audience. 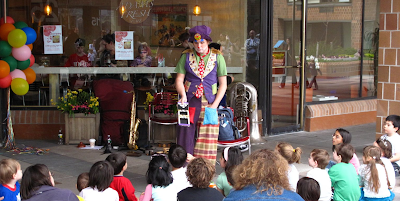 The Waterside Plaza, a perfect venue for making magic, and drawing a crowd without a magic pen. It was the grand opening of Adam's Fresh, a new cafe on the square. And it was Grand. We had the creole stylings of real New Orleans style bras band. We had such a good time it was almost a crime. One policeman said he might have to give himself a ticket he was having such a blast. I would have stood up for him. Don't worry. No one gets a ticket when I am on the scene. Only laughter and magic. It's tough to lay down the law so stringently, but someones got to...and I am just the clown to do it. The AIG Trick. Where did the money go? Oh right here in my other pocket. It's The Amazing Miracle Bubble Trick! We are drinking using magic. Don't ask. It is a lot better than a straw, I can tell you that. I don't know who is more surprised, me or my assistant. She is master wand holder. I did it! The scarves connected! I knew I shouldn't have wiped my nose on them. And of course everyone gets a million dollars!